Glen Gardner opened his practice, Glen R. Gardner Landscape Architect, in 2006. Although based in the Lowcountry, his work extends to Louisiana, North Carolina, and New York. 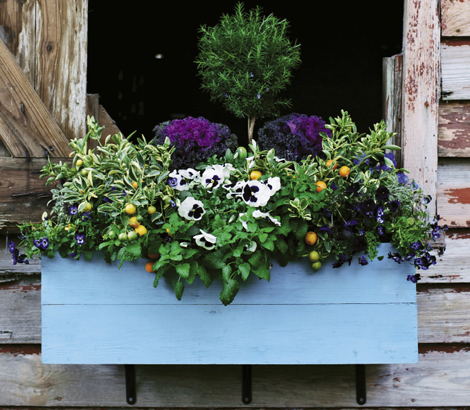 “I have always loved this Mount Pleasant barn and envisioned a blue box filled with beautiful edibles to compliment its all-American rustic exterior,” says master gardener Joan McDonald. For it, she started with a cedar box from Hyams and painted it with CeCe Caldwell’s, a natural chalk and clay paint. “When planting edibles in a box, it’s important to use untreated wood and choose a nontoxic paint so they won’t leach chemicals,” she advises. From there, Joan says, the planting was fast and easy: “Purchase established plants from the garden center to give instant wow factor.” She picked greens, fruits, and herbs that will transition from the cool season to warm season with a few changes. After harvesting the kale and violas, replace with purple basil. The rosemary will continue to grow with the tricolor sage and variegated calamondins, and the lime balm will become the primary trailer. 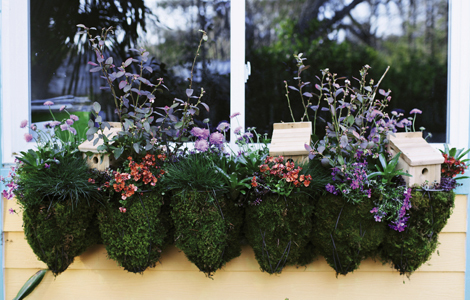 Fertilize: Top-dress the box with a flower-bed conditioner, such as Possum’s. Liquid feed your box every two to three weeks with an organic foliar spray such as fish emulsion. Maintain: When swapping out plants, add nutrient-rich potting soil. Harvest and prune the plants to keep them in scale. Joan McDonald volunteers as a Clemson Extension Master Gardener and writes a gardening blog, “Front Yard to Table,” for www.charlestongrit.com. Inspired to create “a beautiful space that provides wrens with food, water, and nesting areas,” horticulturist Jim Martin went for a chic cottage design, perfect for a bungalow, the backyard, or the beach. He started by fashioning his own “box” from hanging baskets (see caption above), then selected plants that would be aesthetically pleasing and provide for the birds. “The bromeliad’s cup-shaped reservoir serves as a water source,” he explains, “and the shrubby blueberry offers shelter when necessary, as well as a great food source in early summer.” He included materials, such as the blue fescue grass, that wrens can collect and layer in the nesting boxes. The flowers—Diascia, pincushions, phlox, and stonecrop—offer pollen and nectar for both bees and butterflies. Fertilize: Liquid feed every three weeks. Maintain: Pick spent flowers for new growth. Jim Martinis programs director at the Charleston Parks Conservancy and farms through Compost In My Shoe.